As you know, digital tools have completely revolutionized the ways that nonprofit organizations of all types and sizes engage with their donors. What’s harder to know, however, is exactly which online donation platforms are best suited to the specific needs of your organization. The decision can feel incredibly significant, especially since practically all nonprofits have tight budgets. In the search for online donation platforms and services, finding the right fit for the right price can seem daunting. After all, if your organization is conducting an online fundraising campaign, having the right support tools is crucial. Nonprofits should have access to comprehensive information on the tools available to them, so we’ve compiled the ultimate shortlist of online giving platforms and broken them down by category. Consider your organization’s exact needs. If you see anything on this list that already looks like a great match, jump ahead! If you’re still not sure exactly what might be the best fit for your nonprofit’s donation and fundraising goals, read through these top services for some inspiration. You might find the perfect tool to give your nonprofit a major donation boost! DonateKindly is easily the most affordable and comprehensive donation tool for smaller nonprofits. Optimized for organizations with fewer than 10,000 donors, DonateKindly offers a suite of integrated tools to boost both your fundraising capacity and donor retention. Best of all, DonateKindly is free for your organization with no platform fees charged! 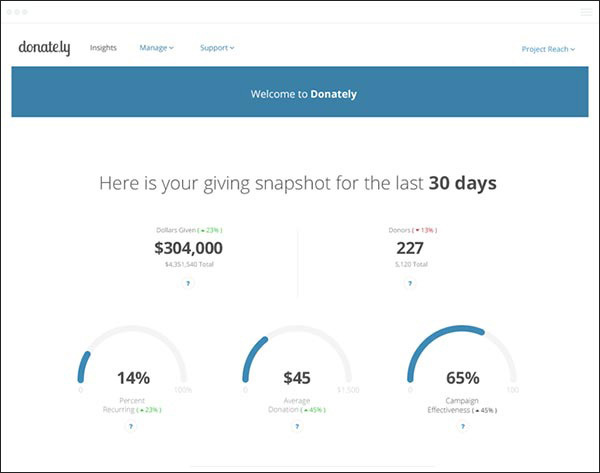 DonateKindly offers a number of automated tools to maximize the efficiency of every aspect of your campaigns. 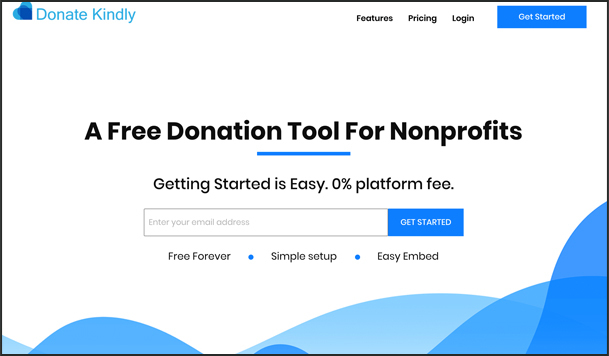 These kinds of tools are typically targeted more towards large organizations, so DonateKindly could be a great opportunity for your smaller nonprofit. Quick payment options for web and mobile browsers to make the donation process lightning fast. Automated messaging for thank-yous, receipts, appeals, and progress reports. As a completely flexible and customizable set of online donation services, DonateKindly can be a perfect solution for any organization. DonateKindly is the only free donation tool for smaller nonprofits looking to optimize their online strategies. And you’ll get full access to the entire suite of DonateKindly products. Fundly might just be the ultimate nonprofit crowdfunding platform. There are tons of crowdfunding platforms out there, but only Fundly is designed specifically to work great for nonprofit organizations. With intuitive web and mobile tools, Fundly lets you get your campaign page running quickly and allows your donors to remain engaged at every stage. Mobile-optimized fundraising pages that look great on screens of any size. Social media tools that let your donors raise awareness on your behalf. Fully customizable campaign pages to maintain your brand and tell your story. Ultra-secure payment methods to reassure donors and make the process fast. Take a look at some of the top-performing campaigns on Fundly. Take note of their causes, initial goals, and final amounts raised. This is the kind of success that your organization can find on a nonprofit-specific crowdfunding platform like Fundly. Unlike other platforms, there is no minimum of raised funds required in order to keep your donations. As a result, Fundly is a great option for organizations of any size. Fundly charges only a flat 4.9% platform fee and then a rate of 2.9% + $.30 per donation transaction. 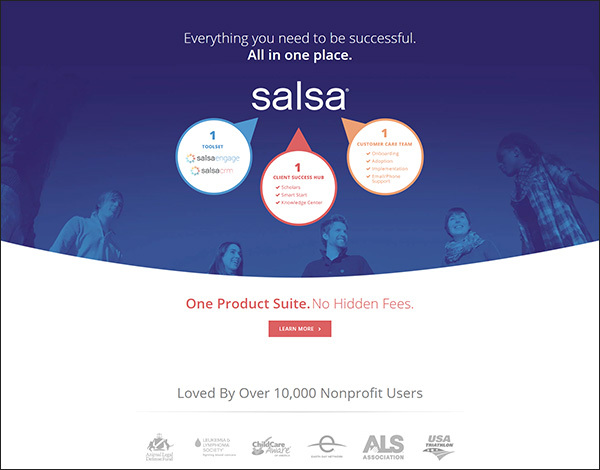 As one of the most comprehensive and intuitive CRMs for nonprofits on the market, Salsa has the tools you need to effectively manage and direct every aspect of your fundraising campaign, from donation pages and processing to donor management and analytics. Keeping the big picture in perspective is essential to effective fundraising, so Salsa unites all the tools and data you need into a single software solution. With flexible tools designed for every side of management and donor engagement, you can receive all the important feedback and data you’ll need to lead your campaign to success. Online fundraising tools to create forms, process payments, and manage registrations. 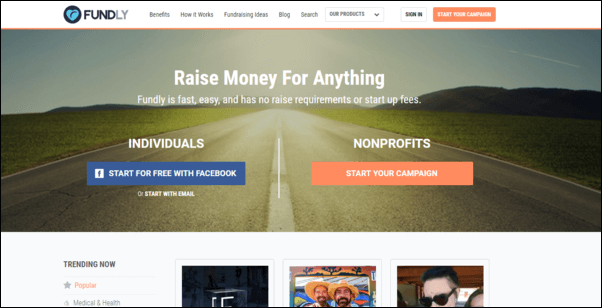 Peer-to-peer options to launch campaigns for your supporters to fundraise for you. Donor and member management to access and analyze exhaustive data for important trends. Digital marketing tools to simplify and even automate your online marketing campaigns. Most importantly, Salsa’s core purpose is to aggregate and analyze your crucial data from each step of your fundraising process. Use this important information to continually fine-tune your fundraising strategies! Distinct software packages for fundraising, full CRM systems, and even advocacy-oriented planning tools are all available from Salsa, so prices will generally vary. If a comprehensive software solution like Salsa sounds like a good fit for your campaigns and operations, request a quote and explore their website. They’ve almost certainly got a tool to solve any problem your nonprofit faces. Donating should always be an intuitive and quick process, and Snowball understands that the point of transaction is the most important link between your organization and its donors. With Snowball’s smart mobile giving tools, you can significantly reduce any friction at this crucial point of contact, reducing donor abandonment and boosting user experience. 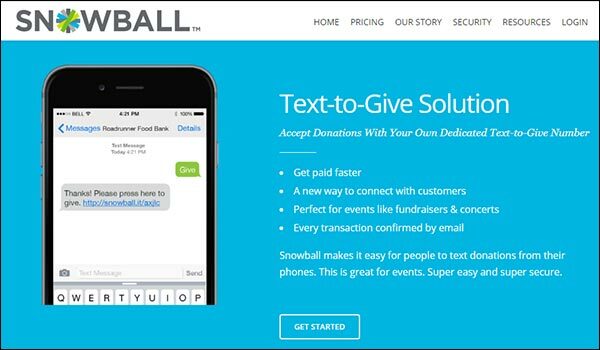 If your organization accepts online donations, or is trying to increase its mobile effectiveness, Snowball offers a number of donation tools that can help. Text-to-give donation services are an incredible opportunity for any organization. Donors send a text message and receive a direct link to complete their donation quickly. Optimized donation pages provide smart design and intuitive payment options. Passwordless login software from Swoop lets your donors easily and securely access your page. 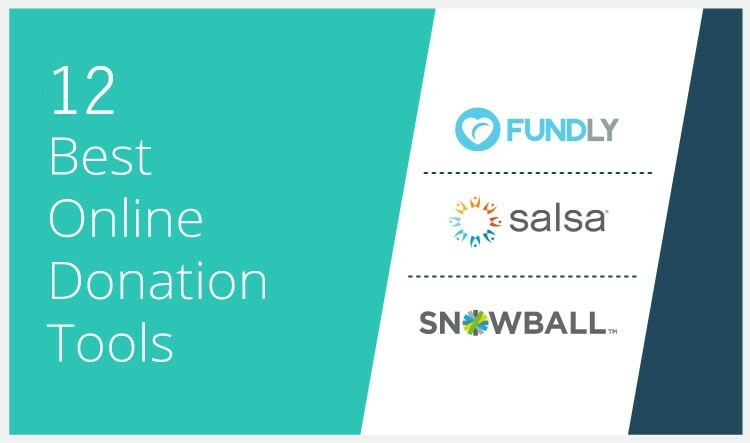 Snowball’s online and mobile donation tools can generate substantial boosts for organizations of all sizes, plus you’ll get access to valuable donation metrics. Text-to-give has become one of the most popular donation methods in recent years, so don’t let your organization miss out! Snowball offers tiered levels of service for its suite of online donation services. Their core package is free to start using and requires only a flat rate of 2.9% + $.30 per transaction. Check out all of Snowball’s options to see which package might best fit your needs. The smartest and easiest way to raise funds with merchandise or clothing, Bonfire is changing the way that organizations can promote their causes with t-shirts. As a fundraising staple, branded t-shirts are the perfect way to raise both funds and awareness while rewarding your donors for their support. Fundraising is never easy work, but t-shirt campaigns are a simple way to make it more fun for everyone involved. Plus, Bonfire makes t-shirt fundraising ridiculously easy. Simply design your products, set your goals and prices, and they’ll handle the rest. Full customization to create branded shirts your donors will be proud to wear. Risk-free minimums, deadlines, and prices that you set for yourself. Online promotion tools to let your donors share their purchase and spread the word. Bonfire believes that your organization should be in complete control of its own fundraising campaign, and it’s easier to ask your network for financial support when you can offer them a beautiful physical product in exchange. Since Bonfire’s service is so heavily customizable, your final cost will depend entirely upon the parameters that you set for your campaign, like your deadline and prices. One totally unique feature of Bonfire is that users essentially set their own profit margins. Since their clothing is offered at a low base cost, your profit margin can be quite high. Bonfire lets you be in complete control of your t-shirt campaign. 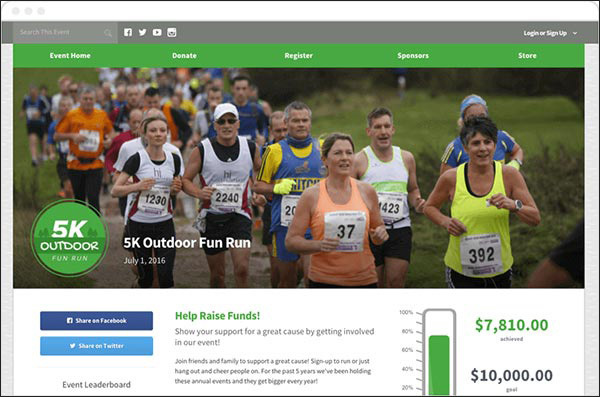 OneCause can offer your organization an entire suite of digital tools to optimize all of your fundraising events. Most importantly, OneCause offers extremely effective online donation and registration tools that can maximize the impact of all your live fundraising events. Whatever kind of events your organization hosts, you can find a tool to make registrations, payment processing, and mobile giving a breeze. Intuitive event software to efficiently manage registrations, ticketing, payments, and data collection at any of your live events. Mobile bidding and auction systems that your donors will love using at your fundraising auctions or for online-only events. Mobile giving technology to complement these tools and give supporters the option to donate quickly and spontaneously. All of OneCause’s digital fundraising tools work in harmony to boost the effectiveness of your overall strategy. If your organization is looking to develop its own toolkit of fundraising tools, OneCause is a great choice because their management interfaces are extremely intuitive and easy to use. Your nonprofit is free to explore and choose which OneCause tools would be most valuable to your campaign, so prices for customized software solutions will vary. If you’re interested, browse their site and then contact OneCause for a custom quote. Donately is a leader in helping nonprofit organizations create beautiful and streamlined online donation pages. If your organization is small- to medium-sized, you might not need every service offered by a full-scale online fundraising package. Donately believes that you shouldn’t have to pay for what you don’t need and that solutions should never become overwhelming. 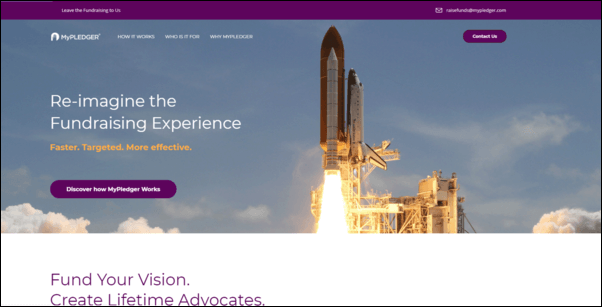 With its minimalist approach and focus on design and quality, Donately is an excellent option for smaller nonprofits that need to update their online donation pages and systems. Custom donation forms and pages that are not only beautiful but also easy to use on both web and mobile browsers. Embeddable donation tools to put wherever else you want to give supporters the option to donate. Peer-to-peer fundraising options to let donors easily create their own individual pages to promote and raise funds on your behalf. Integrated app support to track donation metrics in MailChimp, Google Analytics, Salesforce, and more. Donately wants to develop strong relationships with its users, so the cost for your organization will depend entirely upon how much you’re able to raise with Donately’s tools. For instance, you’ll pay only a 3% fee on your first $100K raised with their custom donation pages. The only additional associated costs are for digital transaction processing. Donately requires no contracts or monthly or annual fees. 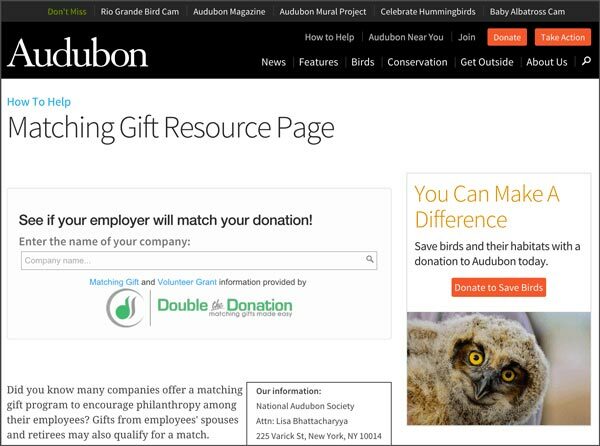 Designed specifically for nonprofits, their online donation services are among the best available for creating custom pages and getting exactly the level of support that you need. Too many nonprofit organizations (and donors!) are unaware of the incredible opportunity represented by corporate matching gift programs. Double the Donation is the ultimate tool to help your organization start making use of these hidden funds. When an employer matches part, all, or more than twice a donation made by an employee, the effects of the original donation are amplified. Now imagine amplifying every donation you received during your most successful fundraising campaign. With some easy tools from Double the Donation you can deepen your relationships with donors and local businesses while effortlessly growing your fundraising capacity. Access to Double the Donation’s extensive database of corporate matching gift policies across the country. Dedicated matching gift pages that allow your donors to quickly search for their employers and immediately begin a matching gift application. Embeddable plugins for your other pages or emails, letting your donors determine their eligibility no matter how you’re engaging with them. Double the Donation’s tools are designed to be continually useful for any organization. Matching gifts, though, should be an essential part of planning any fundraising strategy, and Double the Donation can help you to maximize the impact of these opportunities. Double the Donation’s tiered levels of service can be affordable tools for organizations of any size. Check out their site for more information or to start a 2 week free trial of their software. Remember, investing in your nonprofit’s ability to make use of matching gift programs will provide a permanent boost to any of your future fundraising campaigns! While many fundraising solutions focus on streamlining the crowdfunding process, Qgiv instead gives you effective tools to run and optimize your peer-to-peer fundraising campaigns. Think of all the ways your organization engages with its donors through the internet. Qgiv offers software solutions to make any online donation process simple and intuitive, particularly to complement peer-to-peer campaigns. Peer-to-peer campaign management tools to make use of your networked connections like never before. Donation page optimization to ensure your peer-to-peer supporters can donate quickly and easily. Digital tools for fundraising events like software and handheld kiosks can streamline your live events. Any effective fundraising campaign will consist of a number of complementary strategies, and Qgiv’s tools can unite every aspect of your donation process into a more intuitive experience for both you and your donors during creative peer-to-peer campaigns. Like other online donation platforms, Qgiv offers several tiered plans of service. Most importantly, Qgiv requires no full contracts to use their plans, and your organization is free to switch plans at any time. Starting with Qgiv’s free-to-use core package, you’ll pay only a transaction fee of 3.95% + $.30 per digital donation. Specific industries require specific fundraising tools, and CircuiTree certainly provides. CircuiTree is the top camp registration and management tool because it helps camps with every aspect of their mission. In addition to registration and management, CircuiTree empowers your camp staff to hire and manage your counselors, communicate with your community of camp families, and offer discounts and scholarships to campers. When your camp needs to raise money for a capital campaign, support your scholarship fund, or purchase supplies for the activities that you offer, there’s no better software solution than CircuiTree. Because fundraising isn’t in the usual wheelhouse of most camps, your fundraising software should support your staff throughout the whole process. When you can build contact lists, reach out through various avenues, and offer easy donation options, your staff will be able to fundraise with ease. Product sales and add-on options. When parents purchase camp shirts for their children, they’re offered the option to donate to the scholarship fund. This feature increases the visibility of your fundraising campaign. Easy communication tools. When you need to send out your solicitations, don’t fret about how to get the word out. Use CircuiTree to email your segmented lists about your fundraising campaign. Online donation options. Your camp parents are already familiar with your camp registration software. Because the donation button can be included on the main menu, your campaign will be easy to find and even easier to contribute to. Because CircuiTree’s fundraising options are included in the camp registration and management software, you’ll always be able to keep track of your camp families and donors. Because CircuiTree works closely with your camp to create a customized software solution, the cost of the platform varies. Contact the CircuiTree team today to get a quote for your camp. Securing funding for classroom projects can be an uphill battle, but DonorsChoose is one of the easiest and most reliable crowdfunding platforms for teachers. 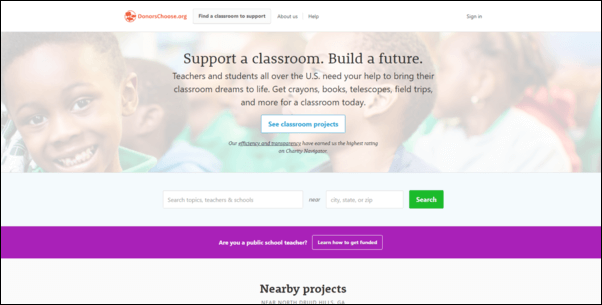 Itself a charitable nonprofit, DonorsChoose provides a unique service for teachers to create campaigns, promote them, and reach their goals quickly. Check out some stats to see why DonorsChoose is a proven choice for teachers across the country. Post your project and upload media to tell your story, and reach your fundraising goal in a few days. DonorsChoose will purchase the materials for your project and ship them directly to your school. Provide some feedback to help keep DonorsChoose the most transparent platform out there. The project materials are yours to keep! DonorsChoose is dedicated to helping teachers continually improve their students’ experiences. As a charitable nonprofit, DonorsChoose is completely free to use! If your project doesn’t reach its fundraising goal, your donors will simply have the option to redirect their contribution to your next campaign. Described as an “easy, effective accelerator for nonprofits,” MyPledger is a great service that any organization should consider keeping in its toolkit. Designed to take the stress and thought out of follow-ups and donation collections, MyPledger can help you better focus your attention on overarching fundraising strategy rather than time-consuming details. Automated messaging via text, call, and email can be perfectly targeted by donor segment and timeframe. Customizable options allow you to fully personalize every aspect of your donor engagement. Advocacy tools let your organization shape the way that donors interact with your cause, building strong relationships. By saving you time, MyPledger saves your organization money and attention that could be more effectively allocated elsewhere. This tool is therefore especially useful for smaller organizations without full-time resources for these tasks. If you think that an accelerator collections tool like MyPledger might be useful for your nonprofit, contact them to discuss a custom quote tailored to your exact needs. Always consider your exact needs and goals whenever you’re in the market for a new software or service solution. You work hard to organize and market your campaigns, so make sure your donation tools are perfectly suited to the job from the get-go. Our top picks for Nonprofit CRM Software Solutions. A comprehensive CRM goes a long way to organizing your operations and streamlining your fundraising. Double the Donation’s Top Digital Event Management Solutions. Finding the perfect management software can be the key to a successful event! Guide to Museum Management Software from Doubleknot. This overview can help you find the right solution to fit the unique needs of nonprofit cultural institutions. I would like to thank you for sharing this amazing and informative content with us. The most informative point in the content is ‘mobile fundraising tool’, it would be really helpful for all of us. The trustworthy platform I use for donating, fundraising, etc is ‘Charity Giving’.